The SoCalCycling.com Team is very fortunate to have Julbo Eyewear as our official eyewear sponsor. Julbo is headquartered in France and also has a US office in Vermont and has been around since 1888 (Yeah, that’s 1888!). The fit of the Jublo Aero Sunglasses are out of this world with a super comfortable feel. With the fully adjustable nose piece they can fit any rider without them slipping down on your face and the rubber ear pieces provide extra grip around your ears for a snug fit! The Julbo Aero glasses look seriously professional with the whole SoCalCycling.com Team racing and training a full season with them. The shape of the glasses along with the good quality lens assure no wind or dust go into your eyes which makes for great eye protection and wide field of vision make it perfect for cycling. They have different lenses such as the Zebra Light Photochromic lens that offers the most versatlility most lenses on the market. It has a grey tint that transitions according to the light of day or evening and the transition is very quick and almost unnoticeable when your active in any light conditions. 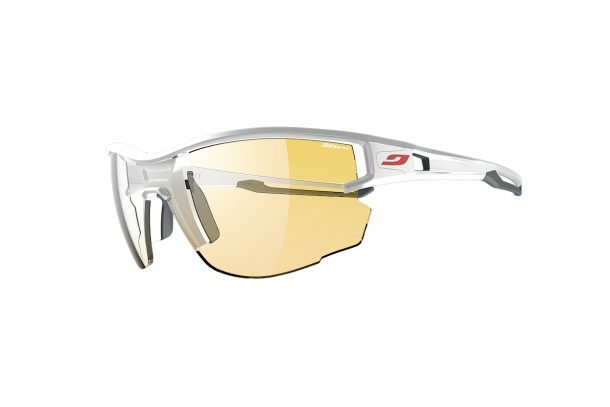 The Aero model from Julbo also provide various different colors that are available on the market that all come in at an unbelievable lightweight of 26 grams per pair, so it’s like you’re not even wearing anything on at all. It’s that light and comfortable. If you see one of the SoCalCycling.com Team riders just ask to try them out on you’ll see for yourself how light and comfortable they actually are to wear. I am a proud member of the Julbo brand and would highly recommend these glasses to anyone who is in the market for a new pair of glasses regardless of what sport or event you participate in or if you are just looking for nice casual eyewear. For More Information and to purchase Julbo Eyewear online, visit julbo.com.